Services: branding, photo shoot direction, print design, print management. The girls from curious came up with some great ideas for our band, they understood exactly what we were looking for! They provided advice and support to us throughout the whole project and continue to do so. Whenever we need anything designed we give curious a call. 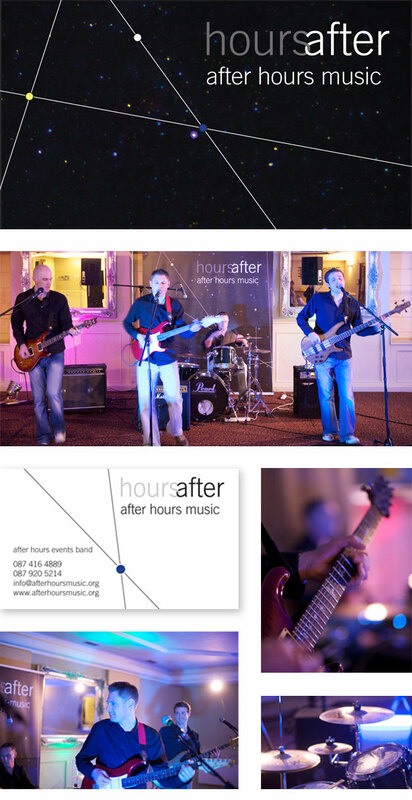 We worked closely with the members of after hours to come up with their logo and branding. The logo playfully puts emphasis on the first word of the bands name but positions it after the word hours, as a play on their name. They wanted their logo to subtly reference that they provide wedding music so we interlinked the ‘a’ from after and the ‘s’ from hours to form a hint of a heart. We have designed a range of promotional material for the band, including business cards and stationery, posters, flyers and a stage backdrop. We also arranged a professional photo shoot and video shoot for the band.